Europe’s network of hydrogen fuelling stations is continually expanding. In practice though, is it really possible to drive a hydrogen fuel cell car from northern Europe to southern Europe? 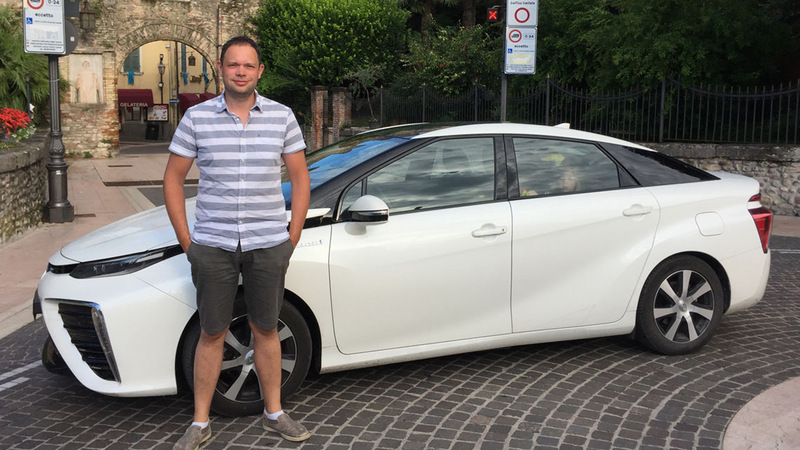 Jacob Krogsgaard, CEO of H2 Logic, put it to the test with his Toyota Mirai. Jacob Krogsgaard is co-founder and CEO of H2 Logic, a leading manufacturer of hydrogen fuelling stations in Denmark (10 stations and counting). A passionate fuel cell evangelist, Jacob won’t be seen driving anything other than a hydrogen powered car. But did Jacob realise that less than a year later, “driving around together with my family” would mean driving from Denmark to … Italy? The creative spark behind this novel idea came from Jacob’s wife Rikke. Keen to reduce the family’s environmental footprint, she asked Jacob whether instead of flying to Italy for their annual summer vacation as usual, it would be possible to drive down in the Mirai? However, even such a passionate hydrogen advocate as Jacob had to think twice about whether such a road trip would be practically possible. First, Jacob calculated the distance from Holstebro, Denmark to Lake Garda in northern Italy: around 1800 kilometres. Then he worked out the number of refuellings that would be necessary, based on the Mirai’s range of about 500 kilometres per tank. Finally, he discovered the locations of hydrogen fuelling stations on the route, as well as close to Lake Garda for local driving. The conclusion? The idea was most definitely feasible! Apart from one detour to Wuppertal, Germany, the route from Denmark to Italy was no different from what it would have been with a conventional car. The road trip was on! On Saturday, July 17th 2016, Jacob packed the family luggage into his Toyota Mirai and off they went. The family enjoyed a wonderful holiday in Italy, and the journey there and back was troublefree. 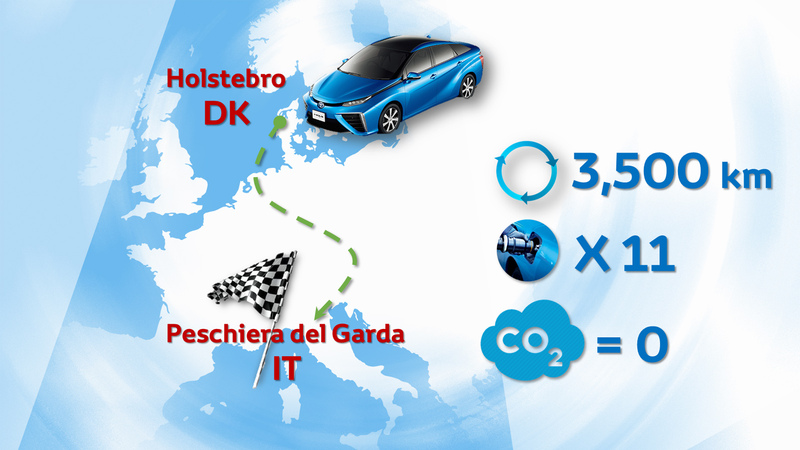 The Mirai worked perfectly as expected, and in total Jacob tanked about 40 kilograms of hydrogen in 11 fuelling stations to cover the 3,500 km round trip from their house in Holstebro to Lake Garda. Refuelling the Mirai was as easy as a conventional car. It works with a familiar pump and a nozzle, with a keypad and an information screen. A complete refuel takes less than five minutes. In practice, Jacob and Rikke took it in turns to fill up the Mirai’s tank with hydrogen. Jacob’s trip proved beyond doubt that a long-distance journey in Europe in a hydrogen powered car is perfectly possible. With hydrogen fuelling stations ever increasing in number, such journeys are going to become even easier. In Denmark, for example - the only country in the world with a nationwide network of hydrogen fuelling stations - there is a 50% chance that the nearest hydrogen station is only 15 kilometres down the road. Elsewhere in Europe, Germany has 20 operational public hydrogen stations, 50 more are expected to appear by 2018, reaching a total of 400 stations by 2023. There are 8 in the UK, 10 in Denmark and 6 in Norway. This does not include all the private or bus fuelling stations. The hydrogen network is expected to grow exponentially in the forthcoming years largely exceeding 200 stations before the end of the decade. The new age of hydrogen fuel cell vehicles continues to gain momentum! Fuel cell for business customers The Toyota Mirai is at the forefront of a new age of hydrogen fuel cell vehicles that lets companies enjoy low whole-life costs and the freedom of zero-emission driving, without plugging-in. The Toyota Mirai: Making a start for the better Our world faces many challenges, with Mirai we are making a start for the better, to ensure that we can enjoy a future that cares about the environment. Prius Plug In environmental information page Our world faces many challenges, from climate change and air quality to energy efficiency and safety. With the Prius PHV (the plug in version of our world famous Prius hybrid vehicle), we are reinforcing the line-up of our eco-car range with a vehicle that offers the best of EV driving for short distances with none of the range anxiety for long journeys. Toyota at Geneva Motor Show This year at Geneva discover how Toyota is bringing a better future to the roads – and one car is capturing all of the attention: the new Toyota C-HR!